What subjects are covered by EcoLog Legislation? Why should I subscribe to EcoLog Legislation? What is unique to EcoLog Legislation? What are EcoLog's Special Features and how do they work? Does EcoLog Legislation include the complete text of the legislation? How can I find out if a particular document is available? Do you have the National Fire Code and the National Building Codes in the Legislation service? I don't need the full national subscription. What do I do? How do you keep the legislation up-to-date? How do I know "What's New"? How do I know that I am looking at the latest version of EcoLog Legislation? What does the yellow text mean? What is the Legislation Bookmark and E-Alert Service? Where can I find “What’s New” from previous updates? Why use EcoLog Legislation when I can get legislation for free elsewhere on the Internet? How can I access past issues of EHScompliance.ca? I’m having some technical problems with EcoLog.com. What should I do? How can I find amendments within a document? EcoLog.com is Canada's leading source of environmental health & safety (EHS) news and legislation. EcoLog.com gives you complete access to the authoritative collection of about 3,000 federal, provincial and territorial EHS Acts, regulations, codes of practice, and guidelines, plus monthly compliance updates and vital EHS industry news. EcoLog.com offers online subscription packages of national and regional legislation, legislation by topic (Air, Hazardous Materials, Health & Safety, Land, Remediation, Renewable Energy, Sustainability, Waste, and Water), weekly news and a monthly EHS compliance newsletter. EcoLog Legislation covers a wide range of subjects affecting the environment and workplace health and safety of Canadians, including environmental protection, hazardous materials, workers’ compensation, transportation of dangerous goods, renewable energy, and more. EcoLog Legislation is an online service that gives you the information you need, when you need it, 24/7. It allows you to save time and to remain in compliance via the most up-to-date, consolidated text of Acts, regulations, codes of practice, and guidelines for all Canadian jurisdictions. EcoLog provides you with the critical legal information you need so you can stay compliant with all the EHS laws that are pertinent to your workplace. The information you receive will also help you prepare for critical audits required to verify that you are doing your due diligence. What is unique to EcoLog	Legislation? 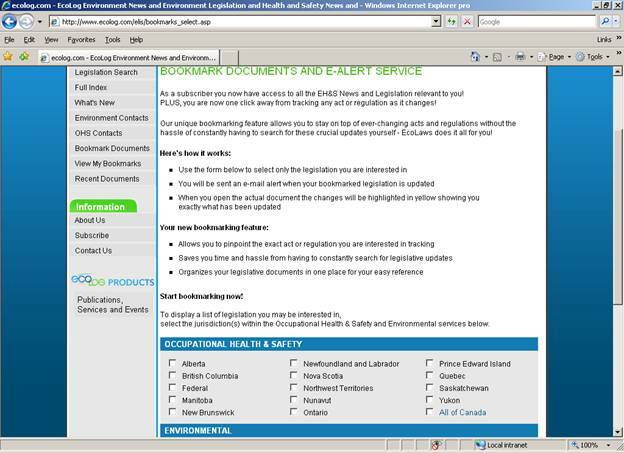 EcoLog Legislation is the only service of its kind in Canada that comes with special features that make searching for, organizing and keeping track of legislation very easy for the user. These features include Bookmarks, E-Alerts, What's New in Legislation, Advanced Search, and Related News and Legislation. EcoLog's bookmarking feature allows you to zero in on the exact piece of legislation you want! Bookmarking allows you to identify and select specific pieces of legislation you are interested in tracking. Bookmarks will store all your chosen documents in one place for your easy reference, so you can save time without having to search for legislative updates. An email will alert you every time there is a change to that particular piece of legislation. The changes will be highlighted in yellow, showing you exactly what has been updated. 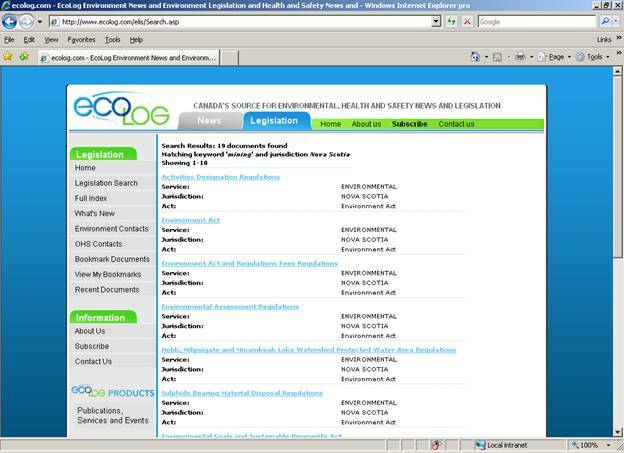 EcoLog Legislation allows you to see at a glance what’s new and what specific sections of legislation have been changed. Simply click on either "Summary of Changes" or "View by Jurisdiction", select either OH&S or Environmental Legislation, select a Province, click on a listed Act or Regulation, and you're done! Plus, you can bookmark your selection and receive automatic updates! Pinpoint the exact piece of legislation you're looking for with EcoLog's advanced search capability. Choose from the Environmental or OH&S database, and search by specific keyword or select your Jurisdiction, Topic and Published Date to refine your search. 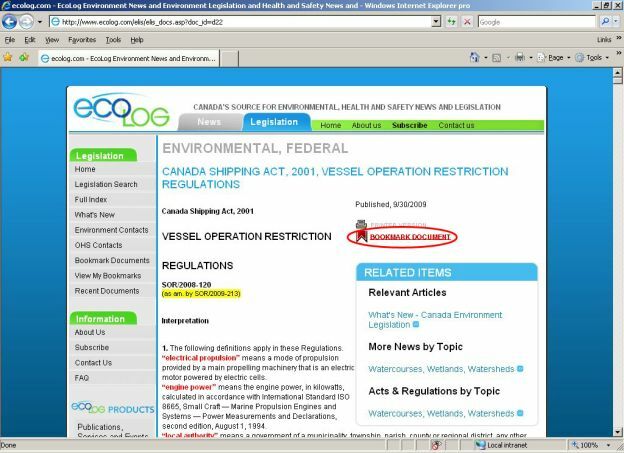 EcoLog Legislation allows you to see related news and legislation on every document page. The related information is sorted by Relevant Article, More News by Topic and Acts and Regulations by Topic links. This function gives you more relevant information and a comprehensive outlook on your topic of choice with the click of a button! EcoLog provides the complete text of Acts, regulations, guidelines and codes of practice that are relevant to the environment and workplace health and safety. In some cases, we include excerpts of the legislation if only one or two sections are relevant. EcoLog Legislation currently carries about 3,000 Acts, regulations, codes of practice, and guidelines. A complete listing is available on the Table of Contents page. You can also use our Advanced Search feature. If the legislation you are looking for is not listed but you think it is relevant to the environment or health and safety in Canada, please contact us and we will add the document as soon as we can. These documents are published by the National Research Council. You must contact the National Research Council directly for your copy. Click here to order. EcoLog Legislation is also available by geographic area — Ontario, Western and Eastern Canada. Each regional collection also contains all the federal legislation since it applies to all jurisdictions. In addition, we offer legislation and news by topic (Air, Hazardous Materials, Health & Safety, Land, Remediation, Renewable Energy, Sustainability, Waste, and Water). EcoLog staff read the latest bills and gazettes from all jurisdictions for the most recent legislation and amendments. EcoLog Legislation is updated monthly. A fully hyperlinked "What's New" document is included in each update of EcoLog Legislation. 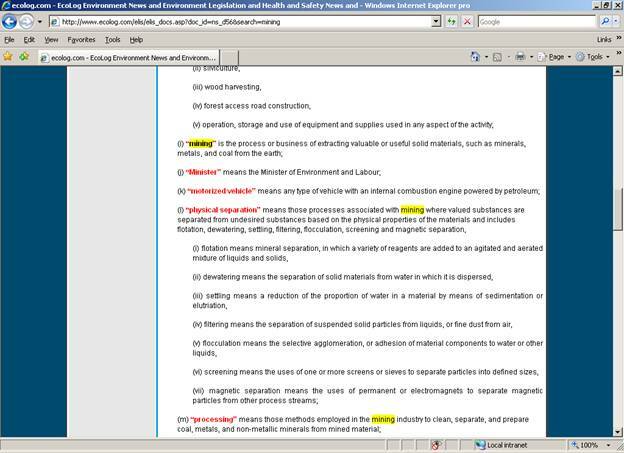 Newly amended text is highlighted in yellow. Subscribers receive a monthly “What’s New” email alert. The date of the latest version of EcoLog Legislation appears on the What’s New page. Also, each legislative document shows its “published” date at the top right-hand corner. Text that is new or amended since the last monthly update appears in yellow. Once we reach the next update, the text that was new or amended in the previous update no longer appears in yellow. Where can I find "What's New" from previous updates? "What’s New" also appears in our newsletters. To see a list of previous updates, go to the EHScompliance.ca archives and click the desired month/year. 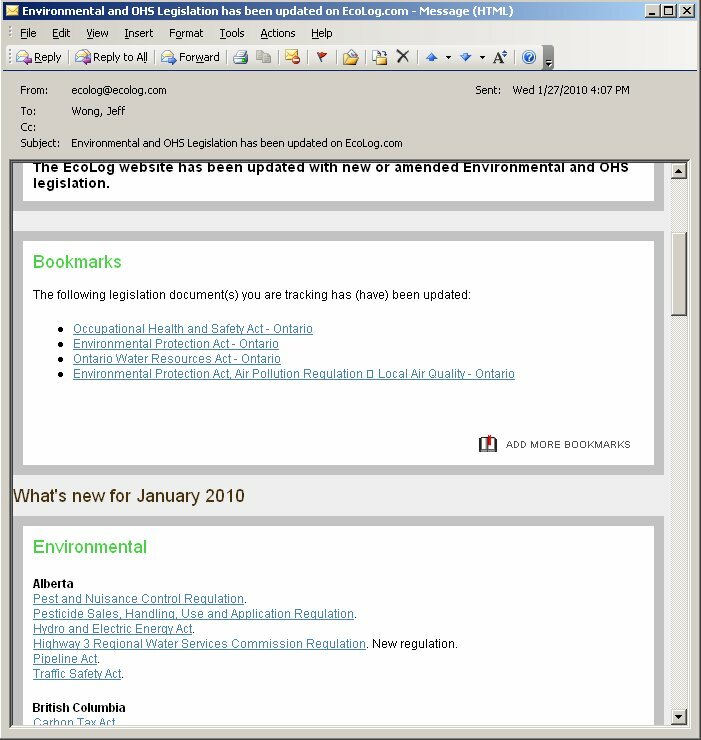 For January 1999 to March 2007, see the archives of ECOcompliance.ca and OHScompliance.ca. For May 2007 onward, see the EHScompliance.ca archives. EcoLog Legislation is the only online service of its kind in Canada that allows users to search for, track and monitor Canadian legislation with ease. While other sources of legislation may be available online, none have the user-friendly features that EcoLog offers, not to mention its credibility as the leading source of EHS information for the past 30 years. EcoLog offers unique features such as Bookmarks, E-Alerts, What's New in Legislation, Advanced Search, and Related News and Legislation. Subscribers to EcoLog also have the added benefit of accessing 15 years' worth of content from our various newsletters. 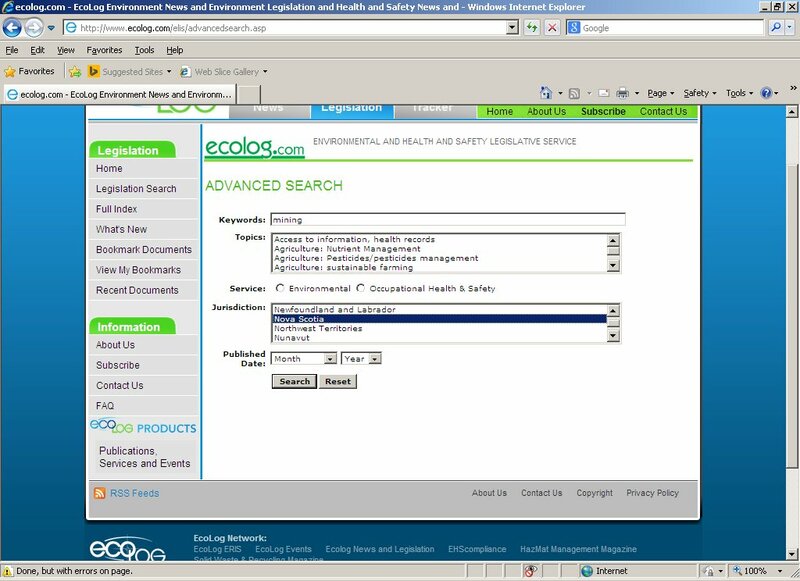 EcoLog makes EHS legislation from all jurisdictions available in one spot. Users can follow hyperlinks between documents of the same or other jurisdictions, view/print text, graphics and tables, and make cross-jurisdictional comparisons. Also, EcoLog updates legislation as soon as new legislation and amendments are available and makes identifying "new" and "amended" documents easy. To access past issues of EHScompliance.ca, as well as ECOcompliance.ca and OHScompliance.ca, go to www.EHScompliance.ca/issues/. Click on the desired archive. Please contact our Technical Support at 1-800-251-0381 or by email at Custinfo@stpub.com. On the What's New page (http://www.ecolog.com/elis/whatsnew.asp), the Summary of Changes specifies the amendments and provides direct hyperlinks. * Identify the citation of the latest amendment. This is highlighted under the document's title. * Activate the web browser's Find function (CTRL-F) and enter the citation. * Click "Next" to find each occurrence of the citation. This will lead you to each highlighted amendment.